The packaging on Olaf's Summertime Fun indicates that it includes a "small ball". I don't think it is supposed to include a ball but my son read the packaging and was disappointed that there was no ball. After watching GBC videos, he is excited whenever he gets a lego ball. I just wanted to make sure that it is not supposed to include a ball. Also, I am curious, how many people would attempt to get a ball due to the misleading packaging? I have asked for replacement parts for broken pieces but this is different. I personally feel a bit uncomfortable especially since the picture does not show a ball and this was a free set (mind you I did purchase a princess set that I would not have otherwise purchased, just so I could get this set). Most likely the warning box just has standard text that can be used on multiple packages. This way they dont have to spend the money on making unique phrases for each one. the "and a small ball" is fairly specific language, indicating a single small ball, which would also be considered a small part... why they felt the need to differentiate that and singularize it is unknown. best guess is that the set originally was going to have a beach ball included, but that got knocked out and the safety note was not revised on the packaging. The "small ball" may be referring to Olaf's head. 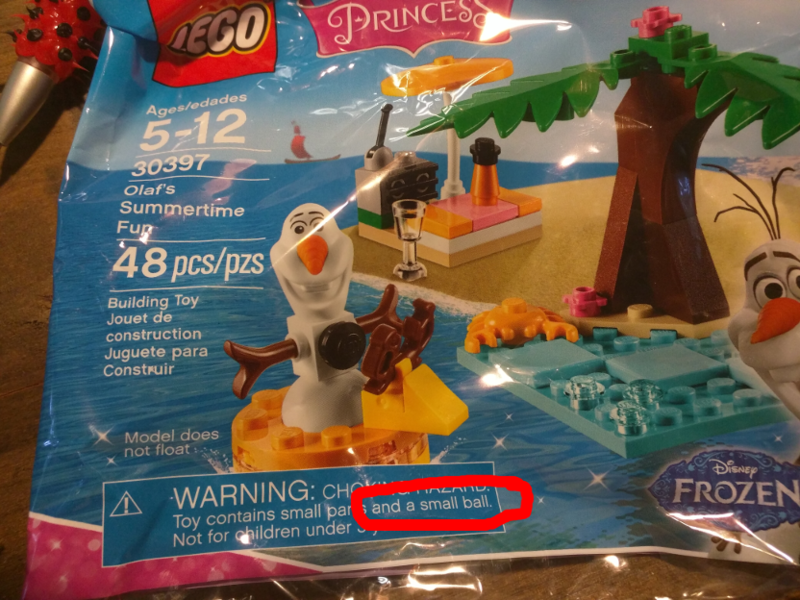 Small ball is on all LEGO packaging now, I believe. I think it is due to the 1x1 round plates. I'd guess that some time ago it was deemed to be necessary to fit in with some regulation or other, on a set with a ball, and it's been cut and pasted ever since without anybody ever reading it again or because it's produced in a country (presumably Mexico) where the local knowledge of English isn't enough for anybody who notices to question it. The Captain America poly I picked up yesterday makes no mention of a ball in its chocking warning. I say you file a lawsuit immediately. Btw, boo on single-word thread titles.